We can only use one type of foil per order so for example you can not order a Foil Worx job with Gold foil on the front and Silver foil on the back. Foil job files are set up just like our Spot UV job files. 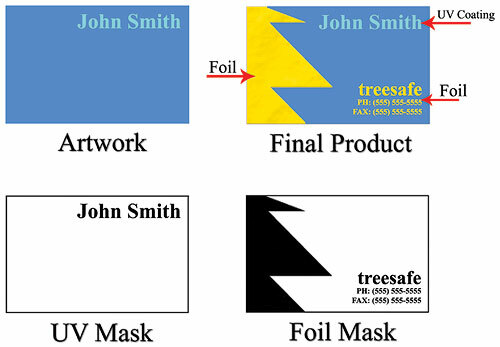 You must provide a separate Foil mask file: black in the areas you want the foil and white in the areas you do not want the foil. All black areas should be solid 100% K with no other added colors. If you order a Foil Worx job with Spot UV, you’ll need to provide separate mask files for the Foil (foil mask) and UV (spot uv mask), in which case you may be required to provide up to 6 files. Please keep in mind, however, that the Foil and UV coating can’t overlap, both should be at least 1/16″ apart to avoid foil peeling off. Also, avoid using small / fine text or lines for foil objects. For best results, please make sure that foil coverage is less than 50% of the entire print side. Also, be aware that there may be up to a 1/16″ shift on the placement of the foil. Keep this in mind if you are trying to align foil with other printed artwork on the card.